There’s no getting around it: Vejer is now, officially, a foodie mecca. In the last few years the tiny white village in southern Spain that I call home has gained more than its fair share of glowing press coverage for the quality of its bars and restaurants. One thing that’s rather gone unremarked upon, though, in amongst all the praise for the town’s dining scene, is, from top to bottom, just how great the local produce is. So by way of setting the record straight, here are a few of the best shops in and around Vejer to pick up a fabulous foodie feast – from chilled beach picnics to sophisticated soirees, you’ll find something in this lot to suit every occasion. I grew up believing that tinned fish was an inferior product. Down here, by contrast, some of the area’s best gourmet delights are tinned, preserved and highly desirable (not to mention pretty pricey). People will give each other special tins of tuna as gifts. If I did that in the UK, my friends would think I’d gone mad. Just around the corner from Barbate’s excellent Mercado de Abastos is Herpac’s shop. A case in point, it’s filled with delicious delights of tinned and preserved tuna, amongst which you’ll find two of my favourites – Mojama Extra (air dried tuna) and atun en Manteca Iberica (tuna preserved in Iberian pork fat). How do you go about preparing and eating it? Start by slicing the mojama thinly and splash a tiny bit of olive oil atop. Wrap it in foil and keep it in the fridge. If it goes white on the outside, it’s only humidity, no problem. It will keep for weeks. In the old days they had no fridges in which to store this so if you have a cool larder, that’s preferable. The atun en Manteca Iberica (the word Iberica is VERY important) is great spread on crackers/regañas and is like a cross between a bacon/tuna sandwich! Serve each with beer or Fino/Manzanilla. 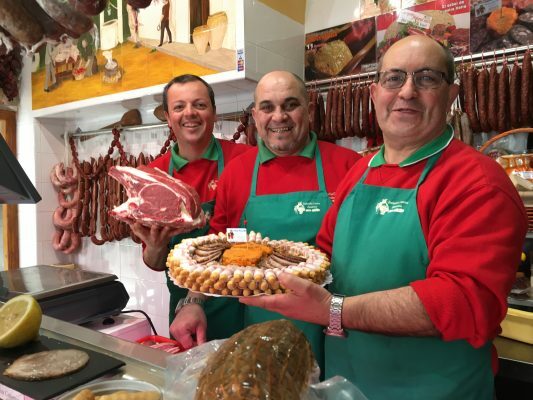 A temple to all forms of preserved Iberian pork, Paco’s homemade chorizo Iberico is outstanding. The red string is with added spice, while the red and white is exactly the same chorizo mixture but without spice. Peel, slice and serve as it is – no cooking is required as they are already preserved with the air. They’re also great to cook with, too. Also noteworthy is Paco’s home-cured Tocino Iberico (preserved jowl of the Iberian pig). He will slice it thinly for you and then at home wrap around picos (bread sticks). Notice photographs on display of his unique Torta Cochina (preserved pork cake). People now order this as an alternative birthday cake. Here too you should buy a small tub of Manteca Colorado/Zurrapita which is for breakfast, on toast. He can vac pack everything for your journey home. Fresh supplies of unique Iberian pork cuts called Presa Iberica and Secrecto Iberico – ideal for your barbecue – arrive each Wednesday. 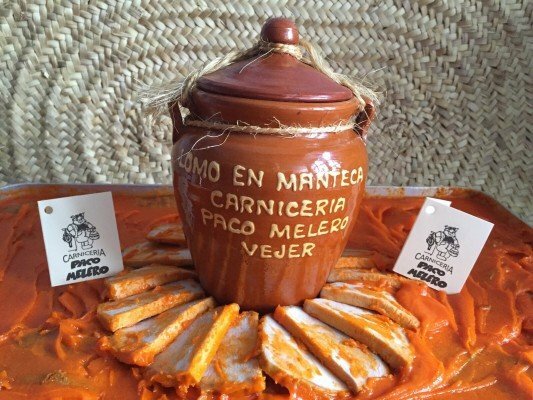 My favourite brand of Spanish jam (mermelada) is Seville-based La Vieja Fabrica. Their melocoton (peach) jam is totally divine. If you’re on holiday, buy an extra jar to take home. Split open and toast a croissant. Lather with this exquisite jam and dream about being back in Andalucia. Don’t be fooled by the outside of Calle Alta – it also offers the best prices in town on all sorts of goodies including wines and beers. 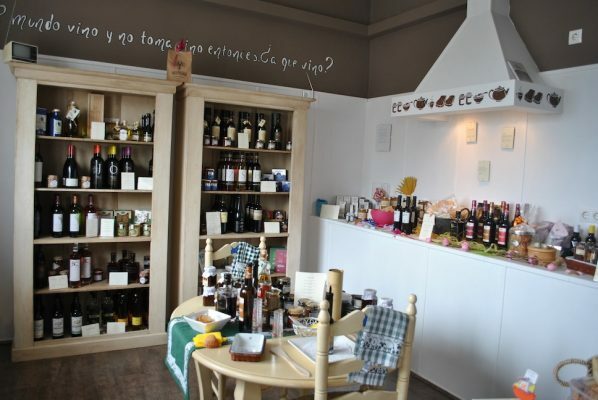 The trio of shops mentioned above all stock a great selection of wines – local as well as from the rest of Spain. There are several delicious local reds (tinto), whites (blanco) and rosés (rosados) to look out for besides Sherry. Keep your eyes peeled for brands Barbazul, Entrechuelos, Furlong, Garum, Samaruco, Cortijo de Jarra and a fabulous sweet Moscatel called Gloria. But the wine made closest to Vejer is Etu (Etu-vino.com). Her Sonrisa red is wonderful – and organic, too. A supermarket? 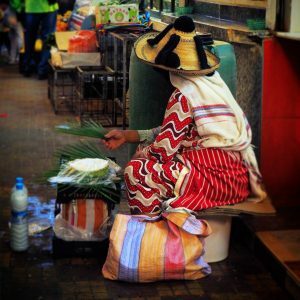 In a foodie list? (Really?) Yes, really. I always try to shop locally but for almonds, I head straight for Mercadona in Barbate or Conil. They stock the best Spanish Marcona almonds in the area – which pretty much makes them the best in the world. In the baking section you’ll find blanched almonds for toasting with some olive oil, salt and smoked paprika. In the nut section you’ll find roasted almonds in their skins, without oil or salt, along with raw almonds in their skins. Almonds are expensive but here they are top quality at a great price. This place is one of my favourite places for breakfast. It also stocks lots of goodies and pan de campo (rustic country bread). 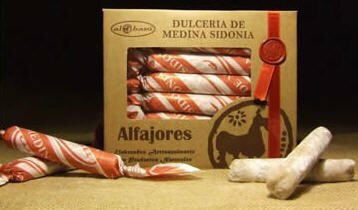 Here too you will find boxes of Alfajores, unique to the nearby town of Medina Sidonia. The size of a small sausage, wrapped in fine paper, they look like micro Christmas crackers. A phenomenal blend of breadcrumbs, spices, nuts and honey, they’re definitely worth looking out for. Best sliced into six and served with coffee or cream Sherry with a bit of orange zest in the glass – ideally both! One way or the other, they’re great foodie gifts to take home. Appetite suitably whetted? 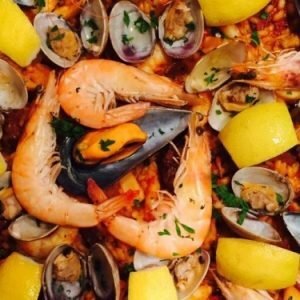 Move on to your main course – my A-Z guide to the Costa de la Luz’s must-try food and drink.